Synulox There are 4 products. 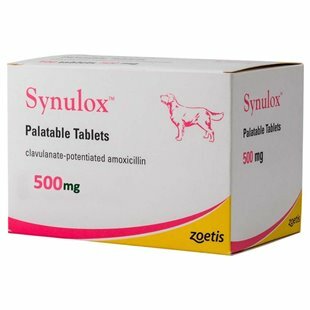 Synulox is an antibiotic containing the active ingredients amoxicillin and potassium clavulanate and is licensed as a treatment for infections in dogs, cats, cattle and pigs. Occasionally Synulox will be used to treat infections in other animals such as sheep and goats. Synulox is available as palatable pink tablets, an oral suspension, a yellow, injectable suspension and intra-mammary tubes and is a prescription-only medicine (POM-V). This means that VetDispense and other online pet pharmacies always require a prescription, written by your vet before dispensing any formulation of synulox. Synulox contains 2 main active ingredients: Amoxicillin and Clavulanic acid. Amoxicillin is known as a ?-Lactam Antibiotic. The main feature of this group of antibiotics is to prevent the formation of a bacterial cell wall (specifically, the production of the peptidoglycan layer is inhibited). Since the bacterial cell wall is essential for bacterial function (especially gram-positive bacteria), amoxicillin is classed as bacteriocidal (able to destroy the bacteria). One big problem that Vets encounter with amoxicillin is bacterial resistance. This is because bacteria are increasingly becoming able to synthesise an enzyme that is responsible for breaking down the ?-Lactam ring. This renders the antibiotic ineffective and it is for this reason that clavulanic acid is combined with amoxicillin to form synulox. Clavulanate can block the enzyme (?-Lactamase), allowing the amoxicillin to interfere with bacterial cell wall production and cause bacterial distruction. Synulox is a broad-spectrum antibiotic. This means that Synulox is able to destroy a wide range of gram-positive and some gram-negative bacteria. Synulox is used by Vets to treat some of the more common infections affecting the mouth, skin, urianary tract, respiratory tract and gastrointestinal system. Bacterial infections can cause a number of symptoms, for example skin infections tend to cause redness and pain, can be painful to the touch, can sometimes discharge fluid and can occasionally smell unpleasant. Urinary tract infections such as bladder infections or cystitis can be painful and cause animals to show signs of abnormal urination (e.g. urinating more frequently than normal, straining, passing red coloured fluid). If you suspect that your pet may have an infection, you should always arrange an appointment with your vet urgently. There are many diseases that can have similar symptoms so it is essential that your vet establishes a diagnosis and rules out the possibility of a more serious underlying condition. Occasionally, your vet may want to find out exactly what sorts of bacteria are affecting your pet (particularly if an infection is not responding as expected) and will consider taking some samples (e.g. a swab or fluid sample). These samples are then analysed in the laboratory and microbiologists perform culture and sensitivity tests. These tests let vets know which antibiotic is most appropriate, establishes whether any resistance exists, and enables more effective treatment of patients. Antibiotic resistance is increasingly becoming a problem amongst both animals and humans. It is for this reason that antibiotics are only available on prescription from your vet. It is important that all the instructions are followed precisely and that the course of antibiotics is completed without any doses being missed. Buying antibiotics such as synulox without a vet prescription is illegal in the UK. Any websites or companies selling antibiotics without prescription are likely to be providing counterfeit medicines that could put your pet’s health at risk. Synulox can be administered by injection under the skin or into the muscle. The route of injection varies depending on the species of animal being treated. Synulox can also be administered orally using palatable tablets or a palatable suspension. The Synulox palatable suspension is more commonly used to treat smaller animals such as puppies or kittens. Synulox lactating cow is used as a treatment for mastitis in cattle and is available as an intramammary suspension. This is useful for the treatment of Staphylococci, Stretococci and Escherichia coli.